Branche: "I am not concerned about the future of market research"
"I am not concerned about the future of market research"
Die Zeiten sind für die Marktforschung spannend und herausfordernd zugleich: Neue Technologien, neue Forschungsmöglichkeiten und auch neue Wettbewerber verändern die Branche. 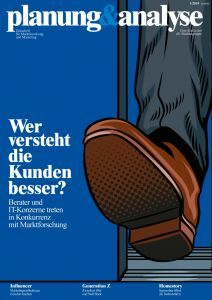 Esomar-Präsident Dr. Dieter Korczak, spricht im p&a Interview über seine Sicht auf die Veränderungen für die Branche, Neuerungen beim Welt-Marktforschungsverband Esomar und die Zukunft der Marktforschung. Dr. Korczak, you are more than half way into your Esomar presidential term: What is your job and function in this role, generally speaking? All strategic decisions are part of the role as Esomar president. Together with council members and the management team in Amsterdam, it is the president’s function to develop strategies for the future of the association. The complete operational business such as member support, organization of events and the annual congress as well as publications are handled by the office in Amsterdam. Although the role of President is an honorific one, it is rather time consuming. The net time I spent in this role was two and a half months in the past year. And this is in addition to my regular occupation as manager of my own research agency in Munich. What changes did you initiate as president within Esomar: What is new and what further changes can we expect in the future? In the past year I initiated a major change for the association, a modernization of the Esomar architecture. 65 years after foundation, the fundamental regulations have been updated with overwhelming membership approval. This change was important because now other national associations as well as research agencies can become members of Esomar. Thus, Esomar is becoming the comprehensive umbrella association representing all players in international market and social research as well as opinion polling. An additional membership vote is planned this year regarding disciplinary sanctions. Because membership for agencies and companies is now possible, the sanctioning processes for violations of the ICC/Esomar-Codex by dishonorable behavior have to be adapted to accommodate this. With this comes a modification of the usage of the Esomar logo: There will be a distinction between the logo for personal membership and corporate members. As a consequence, no agency can display the Esomar logo on its letter head, website or directories when only one employee is a member and not the agency as an institution. This new regulation avoids ambiguity, promotes transparency and improves the management of responsibilities. The times for traditional market research are challenging: New technologies bring about new competitors providing alternative services. Clients seeking new ways to gather insights while spending less are keen on giving them a chance, thus making parts of market research redundant. What is your take on these developments? How can and should the market research industry react? I am not frightened of change and transition, to the contrary, they are part of life and change is a quasi-constant. Every person and every society and thus every association have to react to developments appropriately in order to benefit rather than perish. Of course it is reasonable that research buyers expect new insights from new techniques and suppliers – and if possible for lower cost. Esomar as an association is more or less directly involved in these modernization processes. The continuous updates of the guidelines for market and social research as well as for regular events such as congress and conferences promote this. The conferences and above all the annual congress are events showcasing the industry’s innovations, thus participation is an economical way of advanced education. Of course, as always in life there will be concerns from various sides, but in my mind this has to be encountered offensively. For me, this offensive lies in the debate of quality and not in the debate about change. So you see quality as the key to a longterm existence of market research as an industry? Yes, because it is totally misguided if the market research industry positions itself as a bargain hunter’s market. Quality assured processes, even in times of digitalization, still require resources and manpower and this costs money! It cannot by any means be a goal of the industry to degrade market research to an area of low wages. Even allegedly cheaper online surveys have their price if they should be based on properly administered online panels with quality controls in place. Additionally, the question of validity and representative results arises. Of course the industry can bow out from these quality criteria but this would equally mean taking meaningful market research to its grave. It is a legitimate requirement of research buyers to expect truthful and reliable results for attitudes, behaviors, needs and decisionmaking patterns from market research studies. What about new research techniques such as tools based on neuro-economy? What is your assessment of these? Emerging fields such as neuro-marketing and the attempts to get closer to the consumer by measuring brain waves, imply certain advances in knowledge. One key result of neuroeconomic science is for example, that verbal declarations of intent differ significantly from actual behavior. Actually, this is a wellknown trend amongst market researchers, because actual behavior depends on many different metrics. It therefore remains to be seen if neuro-marketing will stay a niche market despite all contrary PR efforts or if it will be established as a validated research technique. Insofar, I am not concerned about the future of market research if the industry stays in line with applying evidence-based techniques and shows the professional competence of interpreting relationships and nexuses. However, a basis for this is that market researchers have to develop their presentation skills. What is your outlook on where the industry is going in the future? From the association perspective, my personal outlook on the future of market and social research is that we will see more integration of representation of all industry stakeholders under the roof of Esomar. Politically speaking, the relevance of providers from China and India will continue to increase, the same holds true for software and online panel providers as their presence at trade shows already indicates. Generally speaking, the competition in the market research field will become fiercer as DIY tools are a welcome extra income for service providers from various industries. A change of great importance and a big challenge is the growing connection of consumers with the virtual world. I see the current generation of 25 year olds being connected with the Internet from early in the morning until late at night. For these Digital Natives, not only is social media of importance, their whole life is connected to the Internet. I suppose the future is already here that market researchers follow the digital movements of consumers as their shadows. At the same time the everyday job of company researchers will become tougher as divisions are downsized and additional tasks have to be taken on. This is intensified by shrinking budgets with increasing cost control through procurement, reduced capacity to participate in events and conferences as well as the purchase needs becoming more consuming. Dr. Dieter Korczak, thank you very much for the interview!